Last week, my man-servant decided to experiment making his own pizza. Like any good man, he bought a good 10-inch pepperoni link (even though a 7-inch one would have sufficed). And he had lots of fresh basil, roma tomatoes, mozzarella and Parmesan cheese leftover too. The pizza needs more tweaking before I write a recipe for it. In the meantime, I couldn't help but want to use the remaining basil somehow - it smelled so good. Since I had plenty of milk on hand, I thought I'd create a gluten-free pasta dish that would make use of these leftover pizza ingredients. I told my daughter it would be pizza-style pasta and she liked the sound of that. During the week, I'm too lazy to make pizza dough and pasta is quick and easy. This dish reminds me of fettuccine Alfredo with the flavours of pepperoni pizza and fresh basil. What's more, without the heavy cream, it's healthier. The 2015 Milk Calendar was where I found a recipe called Margherita Penne that was easy to tweak. If you aren't on a gluten-free diet, just use regular pasta. 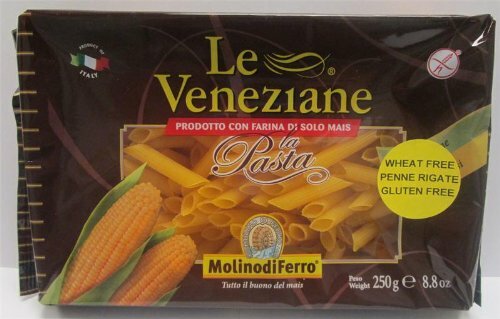 My favourite brand of gluten-free pasta is Le Veneziane. It doesn't become mushy and I find 9 minutes (instead of the recommended 10 to 11 minutes of boiling time) yields the perfect al dente texture. Note: There are other brands of gluten-free pastas cropping up all the time. Some are made with different ingredients like brown rice or with a corn-quinoa blend. Check the directions and "test" your pasta a couple of minutes early for these. A friend of mine told me that brown rice pasta disintegrates when it's reheated. I rely on leftovers because I don't feel like cooking every night, so I stick to my gluten-free corn pasta. Instead of all-purpose flour to thicken the sauce, I used pure corn starch. Note: Some brands of corn starch are made using shared equipment lines that may have wheat-containing products on them. For those with celiac disease, Bob's Red Mill and Argo & Kingsford's brands of corn starch are considered completely gluten-free. Instead of cherry tomatoes (which would be fabulous), I used up the roma tomatoes my man-servant bought to make his pizza. Also, I didn't have Bocconcini (an egg-shaped soft type of mozzarella cheese). I just grated some mozzarella cheese instead. Note: If you are on a gluten-free diet, steer clear of prepackaged shredded cheeses. Often, flour is added to these packs to prevent the cheese pieces from sticking together. For the most part, block cheese is your safest bet. Another point: if you are watching calories, finely grating cheese (like I do, on a rasp) will mean you end up eating less cheese than using blobs or cubes of cheese in a recipe. Lastly, I used pepperoni slices (cut in half) but olives or sun-dried tomatoes would be wonderful additions too. Anything you like on a pizza could be thrown in (just be sure any meat you use is precooked). Note: For people on a strict gluten-free diet, Hormel Pepperoni is labelled as such. The ingredients listed are: pork, beef, salt, contains 2% or less of water, dextrose, natural spices, natural smoke flavoring, oleoresin of paprika lactic acid starter culture, garlic powder sodium nitrite, BHA, BHT, and citric acid. Boil water in a large pot, add 2 tsp. salt and cook your pasta until al dente (firm to the bite). Double check the recommended cooking times for gluten-free pasta since depending on what it's made of, times can vary. Test your pasta 2 minutes before it's supposed to be done. Wash and prep your produce: mince garlic, slice tomatoes, and thinly slice fresh basil leaves. For easier grating, I put my block cheeses in the freezer while I prep the veggies (about 10 minutes). In a small bowl, mix about 3 tbsp. corn starch with cold milk and set aside. Grate cheeses (keep in separate bowls though). Slice any precooked meat last. In a large skillet, over med heat, melt butter and add spices (garlic, thyme, hot pepper flakes, and salt). Stir-fry for 1 minute. Gradually whisk in the milk alternately with the corn starch mixture. Increase heat to med-high, bring to a boil, and immediately reduce to low heat. Continue to stir for about 5 - 8 minutes until sauce has thickened. Fold in tomatoes, pepperoni (or other pizza ingredients) and sprinkle Parmesan over sauce. Keep on low heat. Drain or remove pasta from large pot and add to large skillet (or vice versa). If you enjoy less sauce, you may wish to keep the two separate. However, I found adding the pasta to the sauce, turning to coat it (for about a minute or two) made it tastier. Lastly, add your grated mozzarella cheese and slices of basil. Turn off heat. Serve it up on plates, add salt and pepper to taste, and garnish with sprigs of basil, if desired. My Daughter Likes to Call It "Pizza-Style Pasta"
Each package provides you with about 8.8 oz. For my recipe, you'll need a pack and a half (about 12 - 14 oz). Since your pasta will continue to cook with the sauce for a couple of minutes, I recommend cooking your penne for 9 minutes (instead of 11 minutes). Ingredients: 100% cornmeal flour and water. The yellow color of this pasta is from natural carotenes contained in the corn. (Does not contain any dyes). Made in Italy. This looks so awesome. And I know where to buy gluten-free penne pasta at a local grocery store. Oh it's amazing. My man-servant is determined to perfect his tortilla pan pizza - but until then, this is an excellent use of the leftover ingredients. (When making a 9-inch pizza, not much of the "toppings" are used). Thanks for checking it out and commenting Jonathan! A pasta that reheats without falling apart would be wonderful. We've been using Barilla, which is easy to get here, because it's white rice and corn, but all corn (from Italy) would be even better. I don't do well with brown rice and other harsh whole grains. We had pizza for dinner tonight, and I have lots of leftover Hormel pepperoni. This is a great idea! Yeah, I hear ya. According to Food and Wine magazine, other brands of all corn gluten-free pastas that are good include: Rustichellaâ€™s Corn Fusilli, Sam Millâ€™s Corn Pasta dâ€™Oro, and Trader Joeâ€™s Gluten Free Corn Fusilli. Any short pasta will do in this recipe (doesn't have to be penne). Le Veneziane is a bit on the pricey side and I'm not sure it's easy to find in most grocery stores. You could try the "International foods" section or gluten-free section of your store (if you have that option). Thanks so much for dropping by and commenting. It's an excellent use of pizza ingredients and quite filling. Thanks for all of those corn pasta brands. I really appreciate it. I found the Le Veneziane on VitaCost website where I get my flours, so if I can't find it in the stores here, I'll just order a pound or two online to see how we like it. In the meantime, I'm going to make this with what I have. I finally needed more flour, so I ordered several bags of the Le Veneziane. One of the types I ordered was something that looked like noodles. Hubby's eyes got SO BIG when he opened the box and saw it. It was the best Beef Stroganoff we're ever had gluten free. Funny, but I've always thought corn pasta would taste like corn. Maybe because it's yellow. The thought of it simply being made with corn starch (corn flour) never occurred to me. Thank you so much for the suggestion. We are super grateful to you.